Republican Vice President, Mrs Inonge Wina today took time to visit former Southern Province minister Daniel Munkombwe at the University Teaching Hospital where she has assured the admitted veteran Politician of Government’s commitment to his health. The Vice President said she was confident that medical personnel would do everything within their means to give him the best health care. In appreciating the visit, Mr. Munkombwe described the gesture as evidence that political differences did not create enemies. The veteran politician explained that he has not been well the past few weeks due to the breathing difficulties he is currently experiencing. And while at UTH, the Vice President also took time to visit Chief Chitambo of Serenje in Central Province. Chief Chitambo has expressed gratitude for the Vice President’s visit and used the occasion to tell the Vice President that traditional leaders must not practice petty politics but instead work with the government of the day. In response, Mrs Wina said Government was ready to work with all traditional leaders because of their understanding people’s the needs in their areas. Accompanying the Vice President was Health Minister Dr.Chitalu Chilufya who described the conditions of both Mr. Munkombwe and Chief Chitambo as stable. Dr.Chilufya said that medical personnel at the health institution would ensure that both leaders get the best possible care. PF must appoint Vincent Mwale as Vice President. Where are those PF Cadre who were barking here when HH and GBM visited Munkombwe at UTH, here goes your mama Inonge, so what is your call now? Treating ba Munkombwe like a display cabinet is very disrespectful. Somebody stop this! iwe LOMBE(MA) your comment truly tells your small mind,arent you aware of a running mate? Its not just about appointing. My advise to you take time to read the amended constitution and how she came to be. Can you please clarify what Constitution says that in case the VP resigns or is incapacitated, who will become new VP? Civilized comment from, as you say “… your small mind …” will be highly appreciated. Keve ka chief chitambo kaenda out of topic even when it is on a sick bed. Yikes. Inonge is ordinary woman. I will talk to her daughter, she deserves more grandchildren. @General Kanene:please note that there is LIFE behind POLITICS! !politicians are human beings like all of us who have a heart for each other.recall,Mr Daniel Munkombwe has worked with all Zambian presidents except H.E Edgar Lungu so he still has friends in PF.plus if given a chance by ECL once he is fully fit,Mr.Munkombwe can accept it with both hands and start hiting your HH left,right and centre! !havent you seen how Miles Sampa,Mulenga Sata smile infront of Edgar Lungu seeking a second chance in PF?ZAMBIAN POLITICS ARE CRAZY BABA!! WISH YOU MR.MUNKOMBWE A QUICK RECOVERY!!! Did you read the hate in the article entitled “HH, GBM visit ailing Munkombwe at UTH” published on 27th Oct? 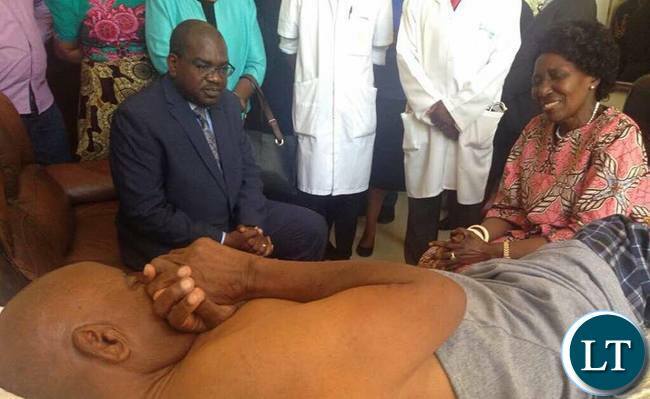 Why should it be an issue when HH & GBM visit Munkombwe in hospital, but okay when mama Inonge visit the same patient? That was my point….and my point was made without any political colours, just asking people to be fair !!!! Good that the lady has found time to visit the old man , very kind of her indeed. Only the other day when HH was doing the same humble thing and he was being criticized for taking photographs with the old man!! Is Inonge wrong to have done a similar thing or are we just showing double standards ? We have a lot of hypocrites in Zambia. Last week, we saw a lot hate messages directed towards HH because of the photo which appeared on this site. Senior citizen and MMD book licker were in the forefront. What are people saying about this photo? A bunch of hypocrites indeed. One wonders whether these people take a few minutes to think about what they write, politically brainwashed, its just attack and attack whenever they see the HH or GBM or UPND. What is so ..s..il.y about them, they think everyone is like them. These PF “intelligentsia” are really shallow minded. Ask Inonge and ECL, and they will give an answer. Ba Chilufya the “best medical care”should not only be made available to prominent people but to all Zambians.This should be your motto.Why are the ordinary Zambians so openly discriminated against? CK may be right. Now they are building an “elite only” hospital in Chongwe…..you heard ECL when he did groundbreaking 3 weeks ago? You should have questioned him. CK was right, but no one is taking him seriously after he failed to keep up to his promise to spill the beans. That was a highly anticipated press conf, by being a coward and succumbing to ECL threats, he disqualified himself. Despicable …utter nonsense !! UTH should have been the one to refurbished and not build a new hospital which will be unaffordable to majority poor Zambians. Typical uneducated brain functioning with no workable priorities.